A little bit brighter – Count Your Blessings, Not Your Chins. And at my worst, I am those things still. I am human and sinful. But then He swoops on in and polishes up my heart, makes it shine and makes me tolerable and even pleasant to be around. That’s all I want to do. In His name. 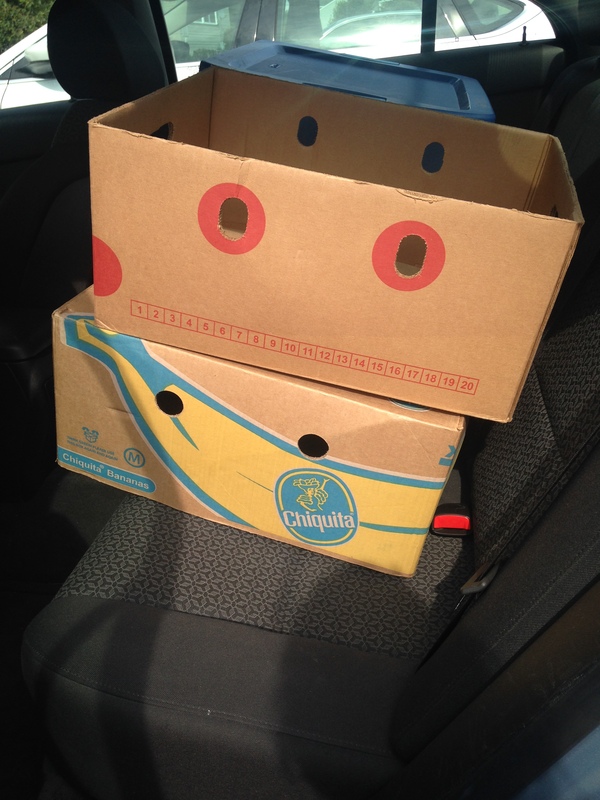 2 boxes that make a smiley face. My favorite thing in the world is making new friends at Walgreens (or insert random local place here). Shooting the breeze with the elderly woman in the elevator. Bonding with the couple next to me at the movie theater. I love people. I connect with people on any occasion possible. My friends get exasperated when I spend 15 minutes talking to the Check-in guy at the hotel (Shout out to Sayeem at the Mariott in Detroit). My family loved to go on cruises when I was young, but my favorite part was talking to the workers on the ship. I like to write long letters on the back of receipts at restaurants. That’s just me. But life isn’t always, or even usually, this bright, bubbly explosion of happiness. Watching the news is like this nauseating experience where I try to come to terms with horrible, unfathomable tragedy happening somewhere. To people. To people I don’t know, but I bet I would love them if I knew them. And then to people who I do know, and who I love fiercely. I struggle with the fact that all around me, in this exact moment, someone is suffering beyond my ability to even understand. Yet my life goes on. I bounce back and forth between feeling unbelievably blessed and terribly guilty, as I try to balance appreciating the incredible life I have while walking alongside those who suffer. So what do we do? Pain and anguish and cancer and suffering and death linger around us. How do we come up against and change those things? We don’t. I can’t change a diagnosis. I can’t take away your pain. I am helpless in so many ways. But there are things I can do. There are ways to make life a little brighter for others. Like I said, I am no Gandhi. I do grumpy REALLY REALLY well. I have real bad days. And on those days, I might not bring the sunshine. It is impossible for all of us to bring the sunshine all the time. Life happens and hurt happens and sometimes you need to be the person that absorbs the light from others. 6 months ago I wasn’t shining. I didn’t have brightness to give. Others lit the way for me as I stumbled down a dark, scary path full of unknown. But then you make it, and you light up again and you do the same for someone else. What a beautiful circle. I just want to encourage everyone to find simple ways to shine into others’ lives. Not huge gestures or life-changing decisions; just small choices we can make as Christians to brighten this place up a bit. A woman was looking at vegetables at Meijers. “I like that scarf” I thought. So I walked up to her and said, “hey I really like your scarf.” I gave her a little smile and walked away. Simple. I didn’t change her life. She is not sitting at home thinking about the strange blonde girl that approached her today and what a difference it made in her life. But it made her smile for a second. It brightened her day just a little. At Arby’s this week, (don’t judge) the older man at the counter was incredibly welcoming, positive and kind. As he was ringing me up, I thought how nice it was to be served by him and treated so well. So I told him how much I appreciated his great attitude and how refreshing it was. (and somehow accidentally upgraded to a larger size). Why do we keep nice things about other people inside our heads where they don’t do any good? What do we have to lose? Let’s build people up. Pour into them. When someone is doing something well, even a random stranger, tell them. Be bold. You know what? Sometimes it will backfire and you will look like a total creeper (I have embarrassed my friends in public many times), but the majority of the time, it will mean more to the recipient then you will ever know. Even if it is just for a moment. I am a relationship girl. I don’t mean dating relationship because clearly that hasn’t worked out in my favor. I mean I love people. I want to be best friends with everyone. The doctor that pulled out my wisdom teeth could have given you a detailed itinerary of my girl’s road trip coming up: (shout out to Dr. Maribelli…4 years post-op and doing great) I become emotionally invested with the mechanics that change the oil in my car. We interact with hundreds and hundreds of people. But how many of them do we connect with? You don’t need to follow my lead and write a 2 page letter to the gas-station attendant because you spilled your coffee on her…(true story), but take time to ask questions and smile and care about people. It isn’t about sharing your life story with the UPS worker (you can save that stuff for me), but it is about being INTENTIONAL in ALL of our interactions. Showing people, even those we interact with in passing, that they have value through how we treat them, is powerful. Returning things at the store is an opportunity to be a light for Jesus. Every single human interaction is a chance for us as Christians to be a light. Opening up to people is hard, and while it may seem counterproductive “shining” to reveal some of your own darkness, I have found that the more I have opened up in my life, the deeper, brighter and more fulfilling the relationships become. Many of us are scared to show our weaknesses, even to our closest friends and family. It’s hard to admit we are in counseling, struggle with body image, or wrestle with doubt and anxiety. We cover up with filtered instagram pictures and mask our pain. Even in our deepest relationships, we as humans as a tendency to hide. Some people have told me that they think I am brave for “having the guts” to share some of my struggles publicly. But do you know how freeing it is? I don’t think it’s brave. I think knowing the freedom I feel now, I couldn’t imagine life any other way. Life pretending isn’t for me, and not because I’m strong, but because I am weak. I need people to help carry me sometimes, to support me and pray me through. We all do. We hide our darkness for a million reasons. Shame and embarrassment. Pride. Fear. But I truly believe the more we open up to each other in our close relationships, the brighter this world will be. There is not much I can do that will change the world. But loving others well feels like a start. This passionate love that I have for people creates this constant yearning and tension inside me to love deeply and genuinely. It is our calling. I love hard and get hurt hard.